I rarely have to travel for work these days which is really nice. At most, I travel to two or three conferences a year, which adds up to about five nights away from my family. Despite the somewhat hectic nature of these trips (i.e., travelling, speeches, workshops, meetings, networking events), it is one of the very few times that I get an overnight all to myself. I usually have the best intentions of squeezing in workouts before, between or after other obligations, and while this does happen, I would be lying if I didn't also tell you that many times I have instead found myself curled up in a comfy hotel bed, eating room service, and watching bad TV or the movies that my husband would never, ever want to watch with me if I were at home. That being said, the first things that I always pack in my suitcase are my running shoes, some workout clothes, and my travel yoga mat. I know that, no matter how exhausted I am, even a short workout will feel better than no workout after a few too many restaurant meals and networking cocktails. On a side note, I am honestly baffled when people tell me they go on trips (any trip) without their running shoes. To me, that is the equivalent of travelling without a toothbrush or underwear. In fact, it is even worse because you can usually get a toothbrush from the concierge and underwear can be worn inside out or skipped entirely if need be. Not do for running shoes. Even if I am only going to be gone for a night, I will usually plan to run and do some combination of in-room workouts during my trip, if time allows. If the hotel gym actually is nice, I may go there instead of running, especially if it is late at night, or during the winter. The following are some of the things that I do to ensure that I can stay fit (and sane) while on the road. 1. Go for Run. If you are lucky enough to be in a nice location, there is often a running route that the concierge will tell you about (some even provide maps). I also always google map/earth the location where I am staying to see if there are trails in the vicinity. For example, on this last trip I did a morning run along a beautiful riverfront promenade that was about a mile from my hotel. This is often a really fun way to see a new city and partake of some of the local fitness culture. Some people also suggest contacting local running clubs, or using sites like MapMyRun as other means to find or participate in local runs. My issue with those suggestions is that they seem like a poor fit for my actual needs on short trips, since what I want to be able to do is leave directly from my hotel during a 45 minute window of opportunity, whenever or however it shows up, not drive to some other location or schedule my run around another's schedule. 2. Do a Short, Sweet and Smart In-Room Workout. I often am amazed at how I managed to do workouts (or anything for that matter) prior to my smart phone. There are several key videos and apps that I have downloaded that make working out on the go a cinch (and are much better than the workouts you can get via the TV in your room). These include the Nike Training Club app, several Baron Baptiste yoga videos, and the latest addition to my collection, the Yogify app. Using these apps/videos I can easily put together workouts of any length or intensity. On my last trip, after a non-stop day, a big dinner, and multiple cocktails, I got back to my room at 10:30 PM and tried the 15-minute Sun Salutation workout from the Yogify app before I went to bed (my only exercise for the day). Just that fifteen minutes of meditation, movement and stretching re-centered me, undid the knots in my feet and legs that a day in heels had created, and contributed to the deep sleep I fell into shortly thereafter. It was my first Yogify "class", and I definitely liked it enough that I will try some of the other, longer "classes" soon. 3. Embrace the Communal Hotel Gym. As a rule, hotel gyms look amazing on the hotel website and, with few exceptions, are somewhat disappointing. Once, I even encountered a stairmaster and a treadmill stuffed into a large utility closet with the label Fitness Room attached to the door. The other thing is, especially at conferences or meetings, you will often find yourself sweating next to another attendee, which always makes me somewhat uncomfortable, especially because I am necessarily wearing shorts and a tank top instead of my professional attire/armor. In that instance, you can just avoid eye contact, or completely own it as a great networking opportunity. Regardless, if the gym is decent, and you have (make) the time - use it. 4. Take a Beat. To the extent you can and need it, just be okay with taking this time (however little it may actually be) and using it to just chill, watch bad TV, order in room service, get a massage and a facial, and otherwise pamper yourself in a way that you never have time to do at home. That is what hotel pay-per-view, hot tubs, and spas are for. Put on that comfy robe and shuffle around in those funny slippers to your heart's content for a precious hour or so - no guilt, no stress, no agenda. Lord knows, those precious moments of peace are not gonna last forever and no one but you can make them happen. Travelling for vacation is fun, travelling for work is only okay, and that is only if you seldom do it. I try to look at work trips as an opportunity, not just professionally, but as a way to experience a new place or to simply enjoy padding around in my blissfully child-free and quiet hotel room. I find that carving out time for myself, even if it is only 15 or 30 minutes a day, keeps me from resenting the fact that I am far away from my family and that my normal, tightly-scheduled routine has been disrupted. On that note, I wanted to offer that, if you are really pressed for time, on a trip or just as part of your everyday madness, according to a recent NYT article that is making the rounds, all you need is seven minutes of intense, interval-style exercise to make a positive impact on your health and fitness. Its pretty hard to say you can't find seven minutes, your own body weight, and a chair. If that is all it takes to extend your life and put a smile back on your face, well then, enough said. 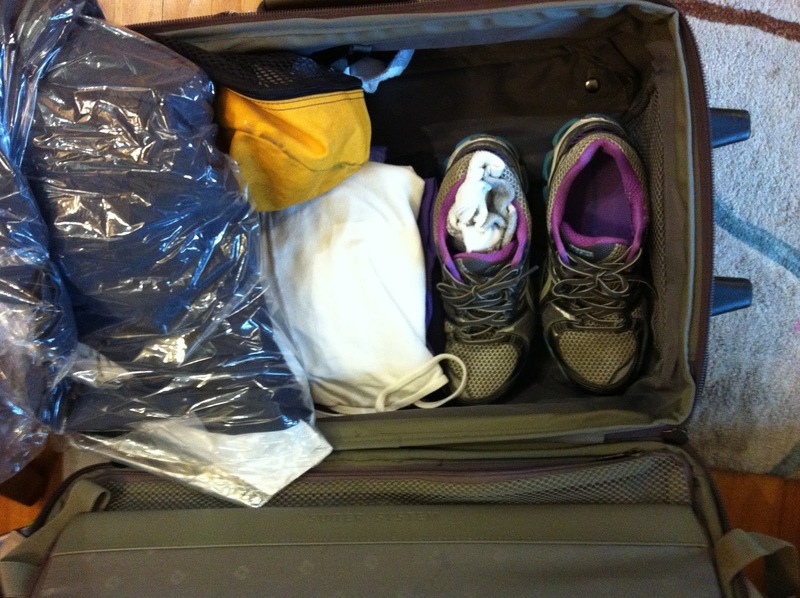 Oh, yeah, except - make sure you pack running shoes!